"Buy U.S. Stamps and Bonds Now! At Box-Office"
"Sign a Bond. . .and Pass the Ammunition. . . Buy Bonds!" "On to Victory! United Nations Week, January 14-20, 1943"
"Buy More War Bonds! They Give Their Lives. . . You Lend Your Money. 2nd War Bond Drive!" "These are the Civil Defense Safety Award Theatres"
Photo by Sergeant James J. Kee, USMC. "Build the Cruiser 'Los Angeles' Buy an Extra War Bond!" "Back the Attack! 3rd War Loan! 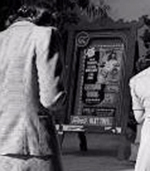 Buy Bonds at these Theatres"
"Back the Attack and See a Great Show! 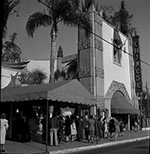 Gala Surprise Bond Premiere at the Paramount Theatre, Downtown, Monday, September 20, 1943 @ 8:30 PM Free Guest Tickets at These Theatres with Bond Purchase"
"Buy Bonds and See a Major Studio Feature Preview at the Pantages Hollwood Theatre, Monday Evening, September 27, 1943 @ 8:10 PM. Free Guest Tickets with Your Bond Purchase"
Induction Ceremony, United States Marines Women's Reserve on Our Stage! California Women! Join the Marines and Release a Man to Fight! Directed by Hal Roach Jr. Honoring the 168th Anniversary of the U.S. Marine Corps. See and Hear Your Favorite Stars at the First "Lights Up" Hollywood Premiere Since Pearl Harbor! William Bendix / Dorothy Lamour / Joan Crawford / Paul Muni / Claude Rains / Lt. Charles Rogers / Reginal Gardner / Maria Montes / Franchot Tone / James Brennan / Roy Roberts / Richard Conte / Lloyd Nolan / Gene Tierney / Roddy McDowall / Anne Baxter / Trudy Marshall / Mary Pickford / Gracie Fields / Arthur Treacher / Ann Rutherford / Mary Blaine / William Blythe / Ralph Bird / Richard Jaeckel and Many More! "Buy a Bond for Xmas - the Gift with a Future"